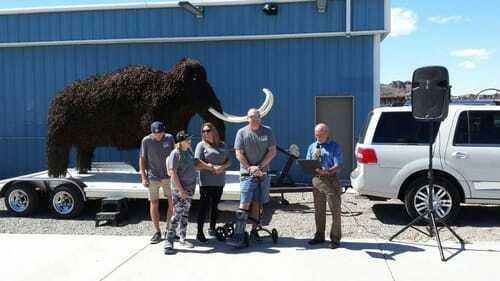 The Woolly Mammoth Has been Resurrected! Have you heard rumblings of the Harvard researchers that are trying to resurrect a woolly mammoth by splicing mammoth genes with that of an Asian elephant? Whether this is new news to you or not, it doesn't matter. Someone has beat them to the punch! 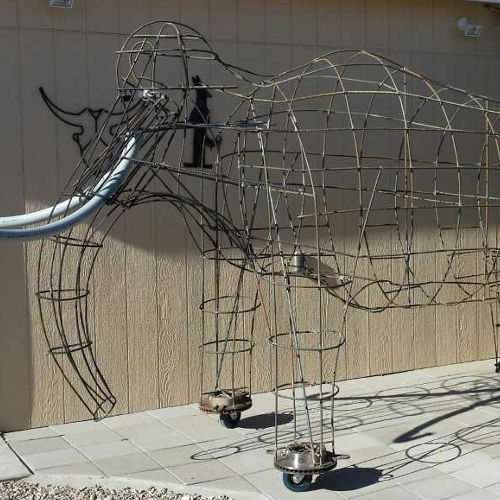 Warren Schoedel from Lake Havasu City, Arizona has engineered his own life-sized woolly mammoth out of rebar and paracord! Working most of the winter in his garage, Warren is finally ready to bring his creation into the light of day. 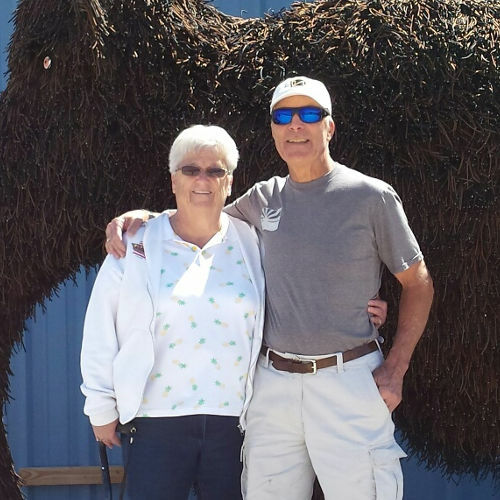 Warren Schoedel and His Mammoth "Shagatha"
Luke: Tell us a little about yourself. (Name, what you do for a living, hobbies, favorite ice cream, anything else you want people to know about you). Warren: My name is Warren Shoedel. I have been a home builder. I did the digging, concrete, block laying, framing, trim, and shingles, but no plumbing, electrical, or sheetrock. I also enjoyed helping as a volunteer fireman for 3 years. Been happily married for 35 years to my wife, Judy Schoedel. [I have] two wonderful children. My favorite ice cream is Ben & Jerry's New York Island Fudge. Luke: What do you like to do when you are not at work or making things out of paracord? Warren: I enjoy running. I have done marathons in 35 states. [When I did] my first, I was 53. Now I am 71--slower, but still doing halfs. [I] also like golf, fishing, and hunting, yard sales, brain storming about out of the box ideas--like living in Colorado Mountain[s] (Buena Vista in the summer and Lake Havasu City in winter. Luke: What is the biggest creative project you have ever worked on? Warren: This [mammoth] is the biggest. I am now glad my garage doors were only 8' tall, or this might have been 10' or 12' tall and I would need a cherry picker to work on it. 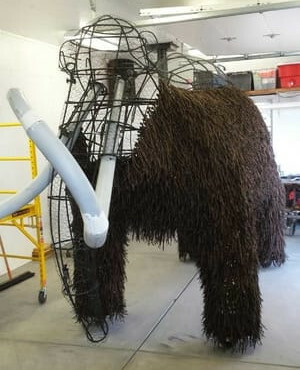 Luke: What inspired you to make a life-sized woolly mammoth out of paracord? Warren: I was hoping for curb appeal from a distance (wow power) (oh my!) -- Also the mammoth helped all of us out 4,000 years ago with food and shelter. They were gentle giants. They used their tusks to remove snow to eat tundra, then helped tundra freeze deeper again, slowing climate change. 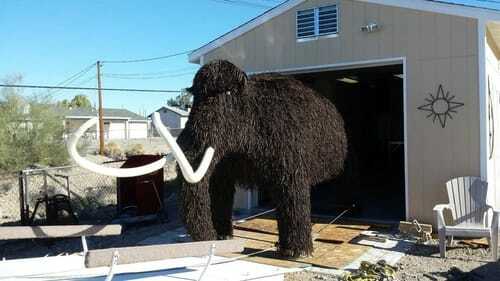 Luke: In your best estimation, how much paracord did you use to make this mammoth? Warren: Actually-- [I used] fifty 1,000' rolls and one 300' roll and 25% of the last 3 that I ordered, so I would have some extra if needed at a later date. All that comes to over 9 1/2 miles. Luke: Was it easier or harder than you thought it would be? Warren: [I] didn't really know what to expect. Each stage was exciting. Luke: Describe your process for us. Warren: Stage 1--Idea--I drew it out full scale on my shop wall on cardboard. Stage 2--Plan Materials--Needed to be lightweight, strong, sun & weather resistant, and cost effective. 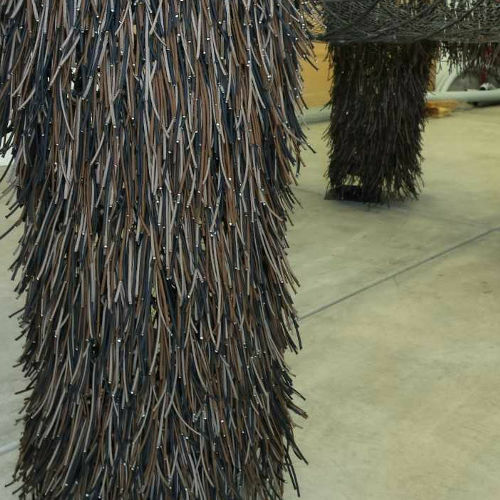 5" steel bearing heels, 500' of 3/8" and 1/2" rebar, 200 square feet of galvanized chicken wire, electrical conduit for tusk, cabinet knobs for eyes, and to get the shaggy look, your wonderful 9 1/2 miles of paracord. Without that shaggy look, it just would not have the wow power, on most of the mammoth there is a knot every square inch and each knot is made out of three 1' pieces of paracord, cut by hand, three at a time in a well-vented shop. Stage 3--What to Do with It-- First debut was on March 17-18th at a Lake Havasu City Fundraiser for local fire fighter who was shot in the leg at the Las Vegas deadly mass shooting a few months ago. Also, I might possibly rent it out a few days for some sales--eye catching promotion--plus local charity events. Luke: What was the hardest part of this project? Warren: When I got to the last side, it seemed to take forever. Coming up with a removable tusk under all the paracord was a challenge, and finding a lightweight tusk material. Luke: Would you ever do something like this again? Warren: Possibly--I think a Polar Bear would be fun. Like the mammoths, they're in trouble these days with all the climate warming issues. Finally, thanks for your help with this fun winter project--and the quick shipping! Luke: We at Paracord Planet would all like to thank you for taking the time to tell us about your monstrous paracord creation. You have certainly made my job fun! Let us know if you ever make that polar bear! 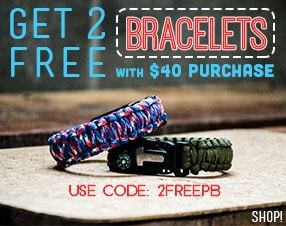 This definitely makes the list of coolest things I've seen made with paracord. What do you think? 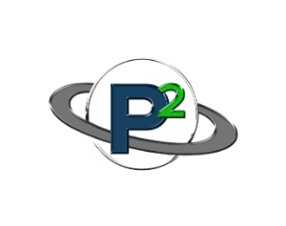 Do you know anyone who has taken on a big project that involves paracord? Let us know in the comments. We would love to hear about what our audience is doing with our products, gigantic or tiny! 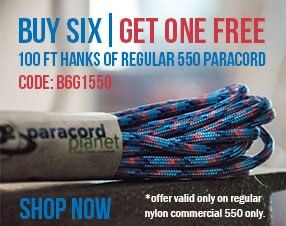 Paracord Planet: Your woolly mammoth supplier.